Upcoming Roslindale Branch library renovations will mean the end of the lovely garden border that RG&C planted and tended for many years. In August 2018, in anticipation of the destruction of the garden and with the help of a group of Boston University students, the shrubs and perennials were dug out of the library garden and moved and transplanted at Taft Hill Terrace and Adams Park. The library beds were planted in 2005 in cooperation with the Mayor’s Office and the Parks and Recreation Department of the City of Boston. The planting consisted of a single scheme repeated five times as it followed the round façade of the building. The plant palette was primarily blue and yellow, to coordinate with the blue and yellow colors found in the decorative tiles and windows of the unusual early 1960s era building. 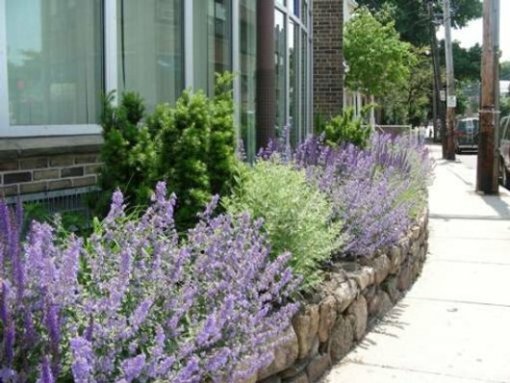 Plants were chosen to be both hardy and drought tolerant, and to provide year round interest to passersby.